For a young adult just out of school, finding that first job has never been easy. Unfortunately, over the past ten years finding that first job has gotten harder. A job market in which more jobs require advanced training, coupled with the lingering effects of the recent deep recession have produced even greater employment obstacles to the young.1 Recent education statistics from the state show that while high school dropout rates are declining, low-income youth or those with limited English proficiency or disabilities are less likely to graduate than other young people. In fact, the number of young adults who are neither in school nor working (so-called "disconnected youth") is growing. This population presents a particular challenge to the state's economy, as those young adults are at greater risk for longer-term unemployment and social dislocation. 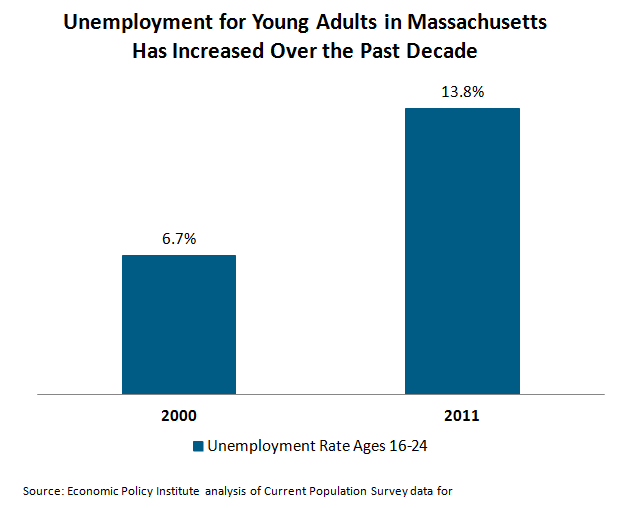 In 2011, 13.8 percent or close to one in seven young adults (ages 16-24) in Massachusetts are unemployed.2 This is a dramatic increasemore than doublingof the youth unemployment rate in 2000, which was 6.7 percent, or one in fifteen. The unemployment rate for young adults is almost twice the unemployment rate for all adults. 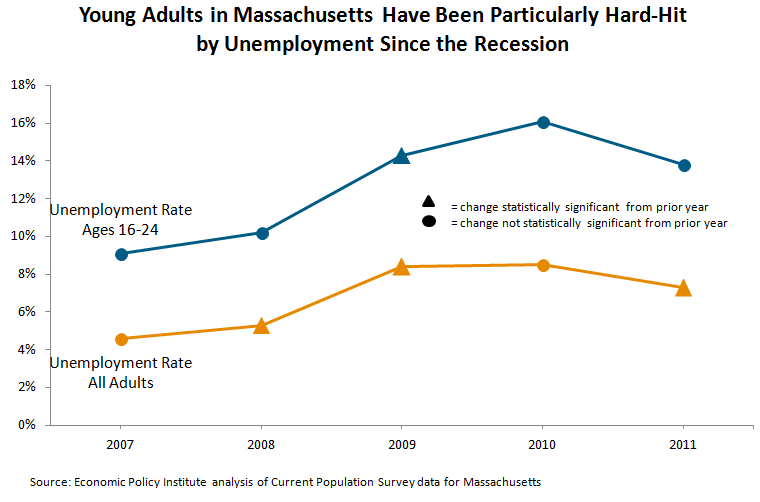 Even though the impacts of the recession may be easing off, the unemployment rate for young adults in Massachusetts increased substantially as the recession hit, and has remained high since then, rising into the double digits. The unemployment rate for all adults dropped slightly between 2009 and 2011, while the unemployment rate for young adults has essentially remained unchanged. Another way to think about employment is to look at the employment to population ratio. This statistic emphasizes the share of a total population (for example, young adults ages 16-24) who are employed. Not all of these young adults are wishing to be employed of course, some are in school full time, some are at home raising children, and others may be out of the labor force intentionally for other reasons. According to a recent analysis conducted by the Population Reference Bureau for the Annie E. Casey Foundation, the employment to population ratio for young adults in Massachusetts in 2011 was 48 percent. This number is close to the national average of 46 percent. In Massachusetts, this number represents 405,000 working young adults. In contrast, in 2000, the employment population ratio in Massachusetts was 59 percent, or 441,000 young adults.3 This drop over the past 10 years is a significant drop in the percentage of young adults able to find work. 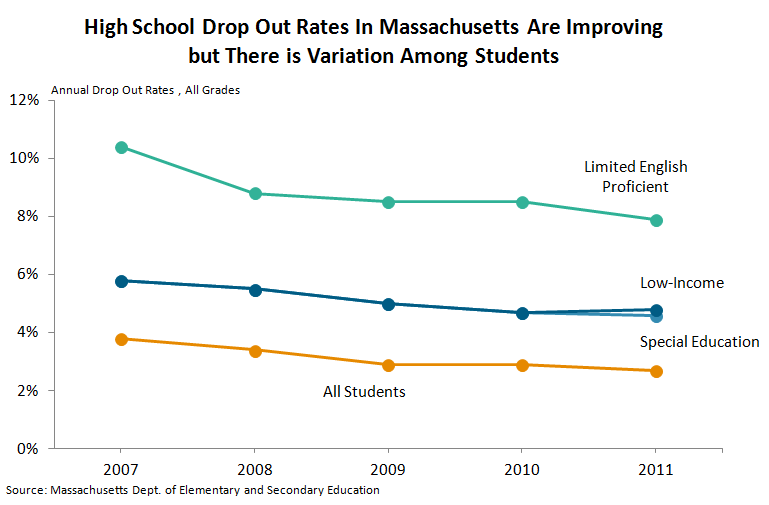 Data show that overall the high school dropout rate has improved modestly since 2007. Unfortunately however, for students who are low-income, have limited English proficiency or have disabilities, the high school dropout rate is notably higher than for high school students in general. An annual dropout rate tracks the students leaving school in any year of high school. Annual dropout rates over the course of four years of high school accumulate, and are significant components underlying the graduation rate of a four year cohort of students. So, for example, if five percent of a cohort of students drops out each year, at the end of four years of high school the graduation rate could be close to 80 percent, barring other factors affecting graduation. All-in-all, young adults who are not high school graduates are far less likely to find employment when jobs are relatively scarce. A recent analysis of Census data conducted by the Annie E. Casey Foundation found that in Massachusetts, close to 134,000 young adults in 2011 are neither in school, nor working. Of these, 50,000 are between 16-19 years old.5 This is an increase from an estimated 92,000 young adults out of school and out of work in 2000. Although there may be many reasons why a young person is neither in school nor working, these young adults are particularly vulnerable to longer term unemployment, and are at risk for lower long term career achievement. In the current economic climate, higher education is an effective route to a better economic future. Massachusetts has a significant financial stake in higher education, providing funding for state universities, community colleges, and technical and training schools. 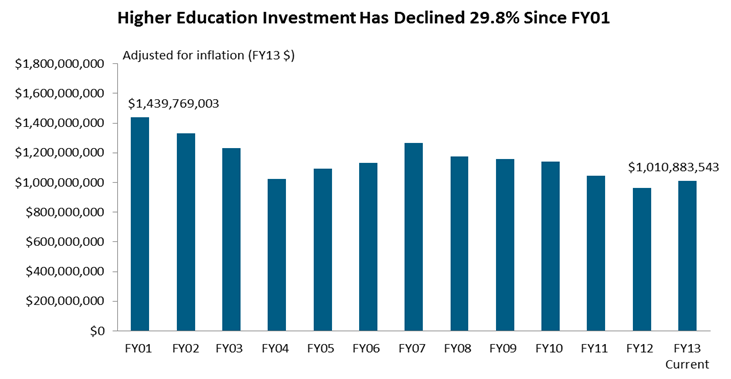 Unfortunately, state investment in the higher education system has declined since FY 2001 by 29.8 percent.6 The chart below shows the amount of money the state budgets for higher education each year. We see that the state made significant cuts to funding in the economic downturns of 2001-2004 and 2010-2012 without corresponding increases during better economic times. Youth-Build, which combines job training with academic programs for students working on their high school diplomas or GEDs. $2.0 million has been allocated to this program in FY 2013, an increase of $300,000 from FY 2012 and up since FY 2010, when the program was only funded at $1.6 million. YouthWorks, which funds the salaries of youth in nonprofit and government jobs. It has received $9.0 million dollars in FY 2013, the same nominal amount it received in FY 2012 and increased from $4.6 million in FY 2006, the year it was created. Connecting Activities, a program designed to place low MCAS scoring youth in career training and placement. Funding for this program was $2.9 million in FY 2013, about the same as in FY2012, but down significantly from $5.2 million the program received from its creation in FY 2003 to FY 2008. The Safe and Successful Youth Initiative, founded in FY 2012, is an initiative by the Patrick Administration to promote and fund activities that deter youth from participating in dangerous activity. In its initial year the program was allocated $10.0 million. Since this a holistic violence prevention approach, some of the money goes towards job placement and employment training. Because it is impossible to isolate youth employment spending, the entire amount of the program was included in the data. The program was reduced to $4.0 million in FY 2013. In looking at funding over the last decade (see following table), we see that youth services funding increased between FY 2004 and FY 2007 and remains greater than it was before that time. There were cuts to these programs during the early years of our economic crisis, but FY 2012 saw increases above any previous funding level. 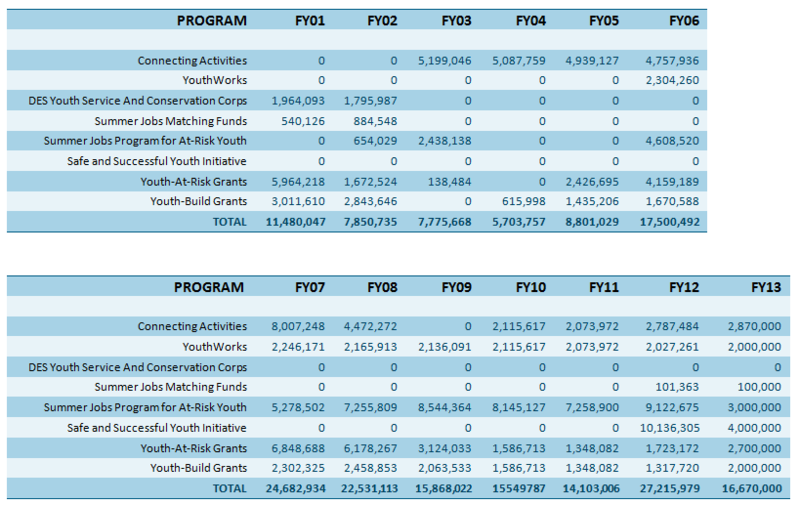 The FY 2012 increase can be attributed to the Youth Violence Prevention Grants and an increase in the YouthWorks program. In FY 2013 funding for many of these programs were cut from 2012 levels. However, the FY 2013 numbers should be viewed as tentative as some of the funding for these programs generally comes in supplemental funding the state allocates throughout the fiscal year. There is a significant danger, however, that due to the Commonwealth's fiscal challenges this year the funding levels for these programs will not be increased from where they areand possibly could be decreased. 1 For a discussion on national employment trends for young adults, see Annie E. Casey Foundation, "Youth and Work: Restoring Teen and Young Adult Connections to Opportunity", December 3, 2012, for which this brief is a companion piece. 2 All employment statistics (unless otherwise noted) are from an Economic Policy Institute analysis of U.S. Census Bureau Current Population Survey data. 3 From an analysis by the Population Reference Bureau of Current Population Survey, U.S. Census Bureau and Bureau of Labor Statistics for the Annie E. Casey Foundation, "Youth and Work: Restoring Teen and Young Adult Connections to Opportunity", December 3, 2012. 4 Data from the Mass. Department of Elementary and Secondary Education is available here. In 2011 the four year overall graduation rate for students entering in 2007 was 83 percent, with lower rates for low-income students, students with disabilities and students with limited English language proficiency. For district-by-district 2011 graduation rates, see the Mass. KIDS COUNT data center. 5 From an analysis by the Population Reference Bureau of Current Population Survey, U.S. Census Bureau and Bureau of Labor Statistics for the Annie E. Casey Foundation, "Youth and Work: Restoring Teen and Young Adult Connections to Opportunity", December 3, 2012. 6 Data from the final budget appropriations by the Massachusetts Legislature Fiscal Years 2001-2013. Inflation adjusted by the Consumer Price Index. 7 Data from the Massachusetts Legislature Fiscal Years 2001-2013 and data provided by the Commonwealth Corporation. Inflation adjusted by the Consumer Price Index.